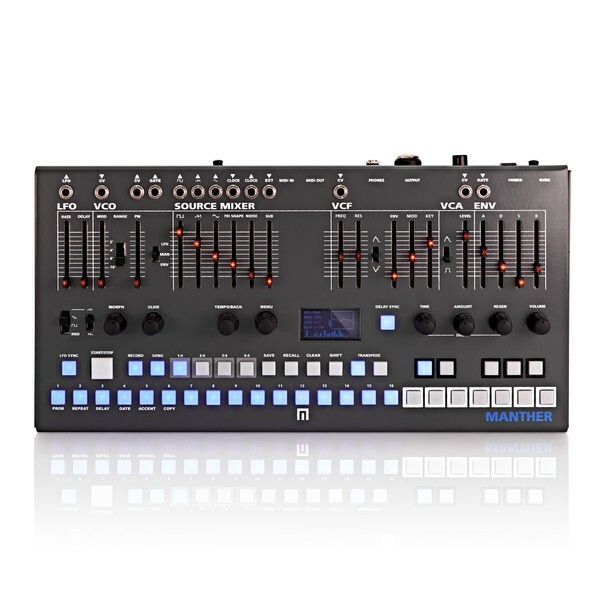 The Malekko Manther Monosynth Groovebox is a compact, desktop analog synthesizer with an integrated 64-step sequencer and onboard delay. The Manther builds on the success of the original design, retaining all the design aspects that made the original so sought-after. 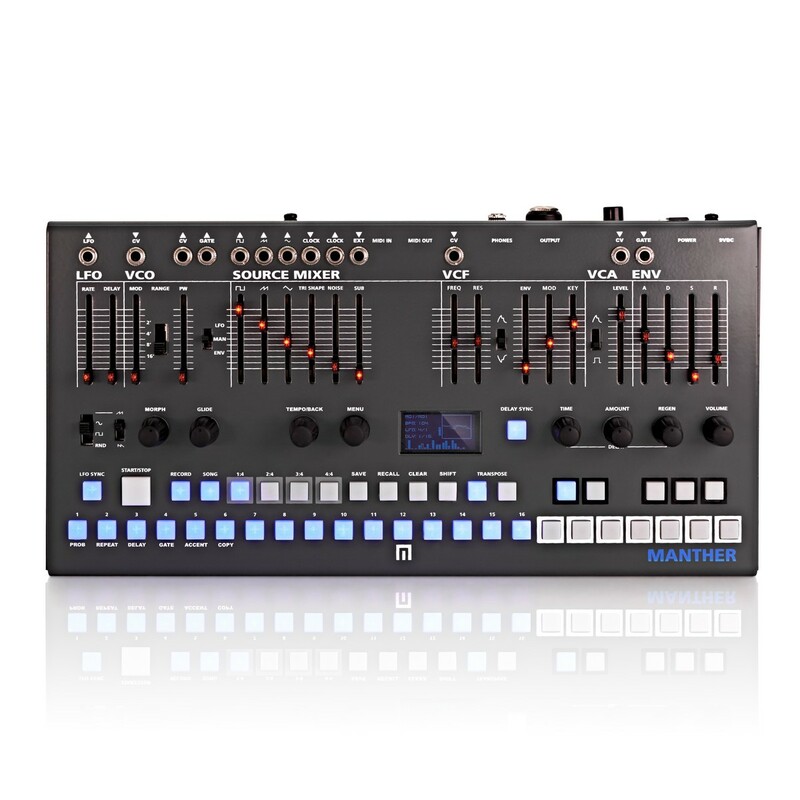 The Manther Groovebox features a keyboard with onboard transpose controls. It boasts 4 banks, comprised of 16 presets each, as well as individual outputs for the square, saw and triangle waveforms. You can also record automation of features per step for a range of parameters. At the heart of the synth is the CEM 3340 based VCO IC chip, complete with an analog filter based on the SSM2055 chip. 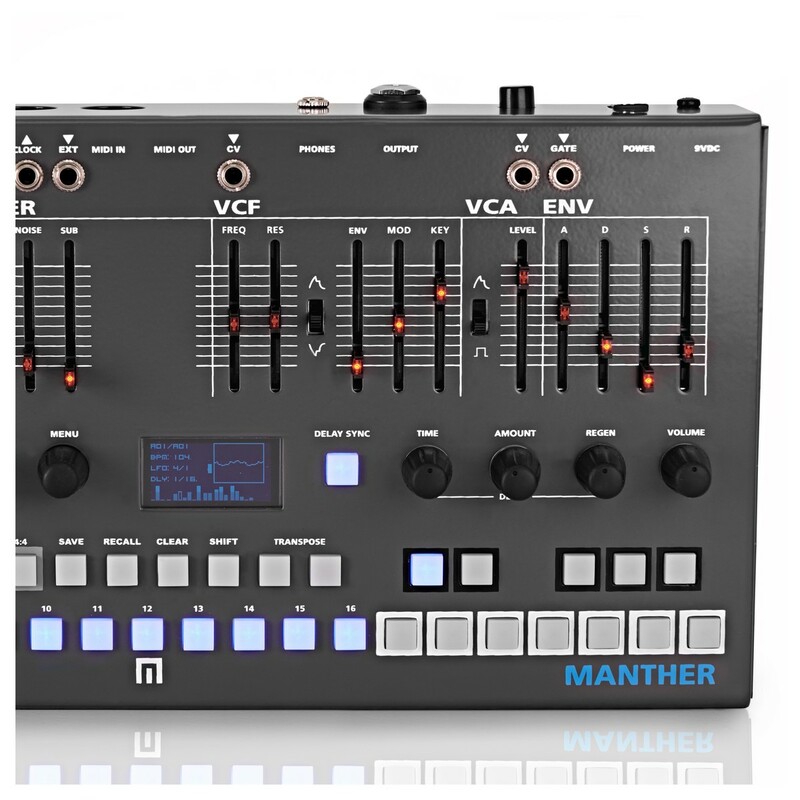 The Malekko Manther Monosynth Groovebox is a compact and portable monophonic synthesizer with an analog signal path. The desktop design is ideal for both studio and live performances. At the heart of the Manther Groovebox is the renowned CEM 3340-based VCO IC chip, complete with an analog filter based on the SSM2044 chip. This captures the essence of analog warmth and grit, resulting in a powerful yet refined sound. The integrated keyboard features transpose controls for switching between octaves and key ranges. It features a wide range of waveforms including Square, Saw, Triangle, Sub and Noise for optimal versatility. 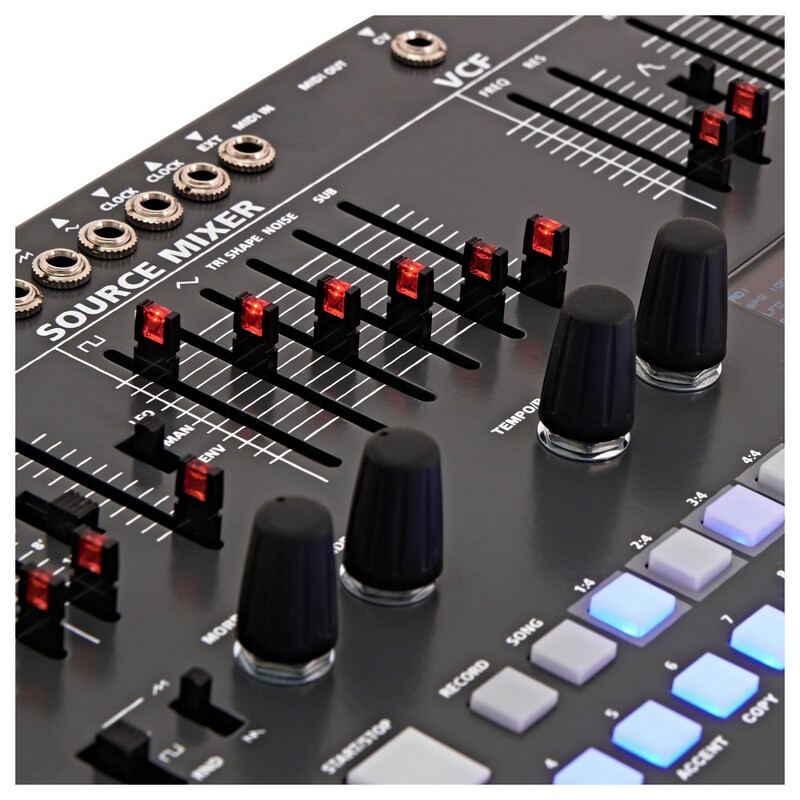 The Source Mixer allows you to blend between the waveforms, providing individual outputs for the Square, Saw and Triangle waveforms. 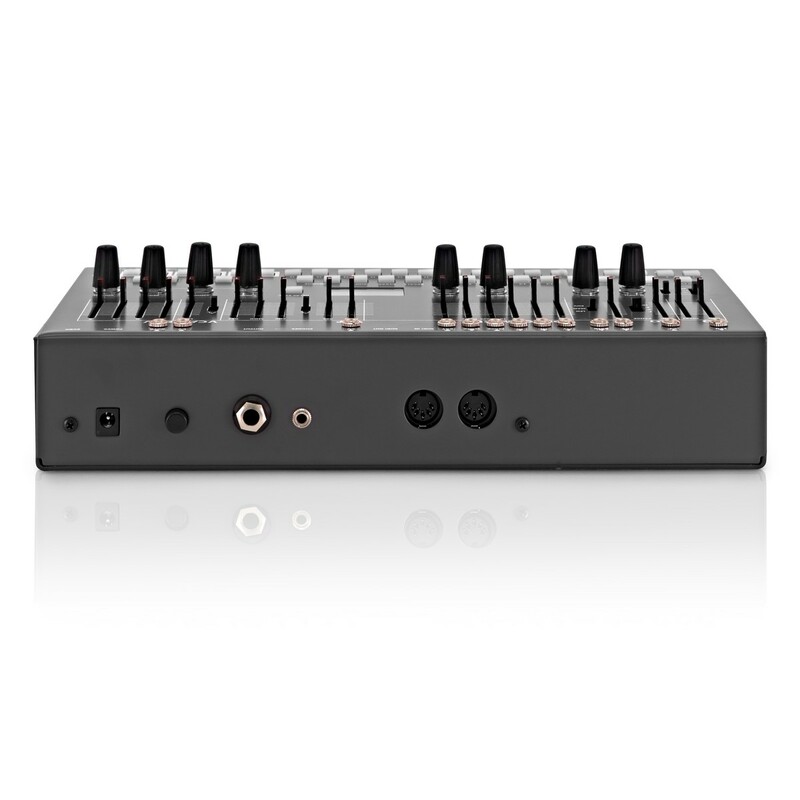 The powerful and innovative onboard sequencer, provides you with 64 steps in total, more than enough to create complex sequences and more. 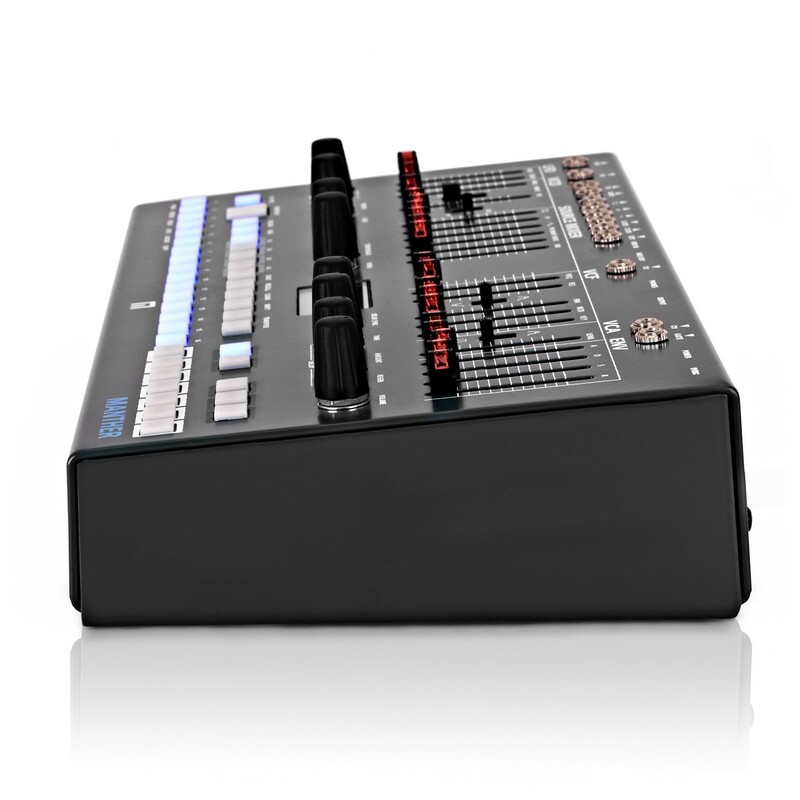 Each step of the sequencer can be automated and saved within a total of 64 presets. 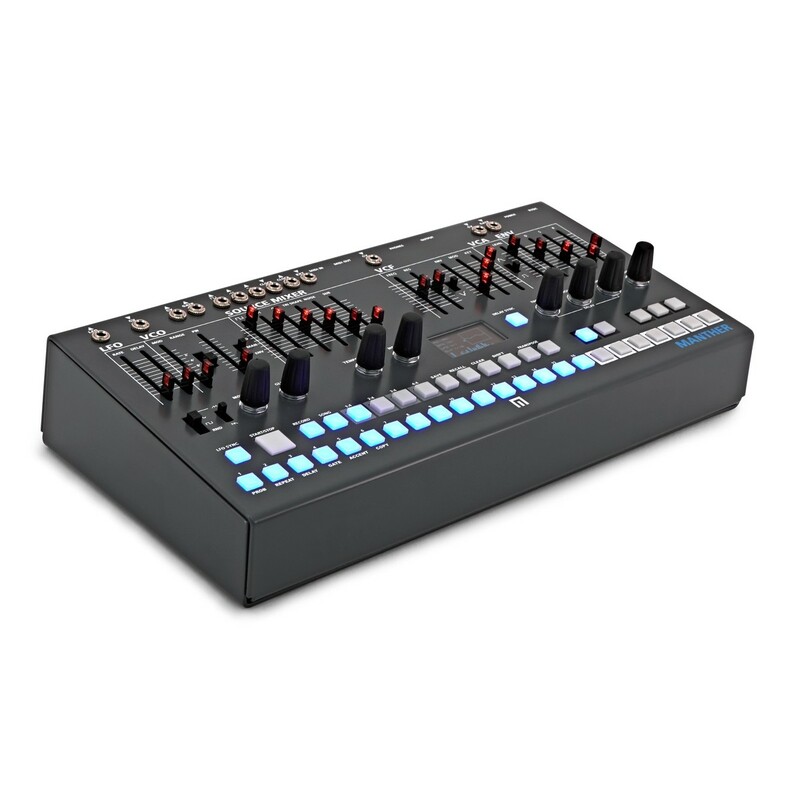 This gives you the ability to create and recall sound sculpting and sequence creations at the touch of a button. The sequencer allows you to quickly and easily build up songs by selecting different presets to play in any order you please. You can use the onboard keyboard to quickly program notes, and the sequencer also boasts Repeat and Probability functions per steps for gate pattern formation. The Manther employs a large number of retro-style sliders/faders for optimal precision when dialling in your parameter levels. The VCF section features Frequency, Resonance, Envelope, Modulation and Key parameters with dedicated sliders for optimal flexibility. The voltage controlled amplifier section features a single level slider with a two-position switch for toggling between waveform modes. The envelope section includes individual sliders for Attack, Delay, Sustain & Release. Encoders are also included for Morphin, Glide, Tempo, Menu and overall Volume. The onboard delay features its own encoders for dialling in the Time, Amount and Regeneration. An LFO Sync button is included toward the bottom as well as Shift and Transpose controls. The built-in LED display provides you with all the information you require for your settings, parameters and controls. It comes complete with its own Menu encoder for scrolling through settings and more. It also features a wide range of connectivity including a headphone output for private monitoring. 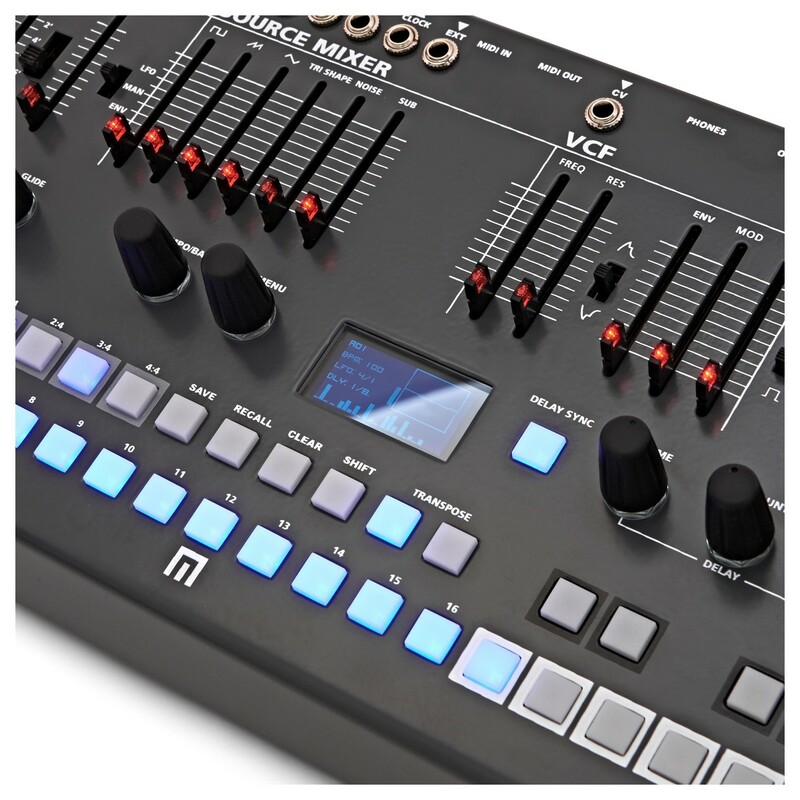 Also included is a LFO Output, MIDI I/O and CV inputs for VC, VCF and VCA. The robust and compact design features a rugged metal enclosure, designed for optimal durability and life on the road.